With the snow already falling, we would like to remind everyone to please you extra caution when driving tonight and to drive only if absolutely necessary. A Winter Storm Warning for snow means severe winter weather conditions will make travel very hazardous or impossible. If you must travel, keep an extra flashlight, food and water in your vehicle in case of an emergency. Check local Department of Transportation information services for the latest road conditions. * WHAT...Moderate to heavy wet snow along with some sleet and freezing rain especially towards the southern coasts. 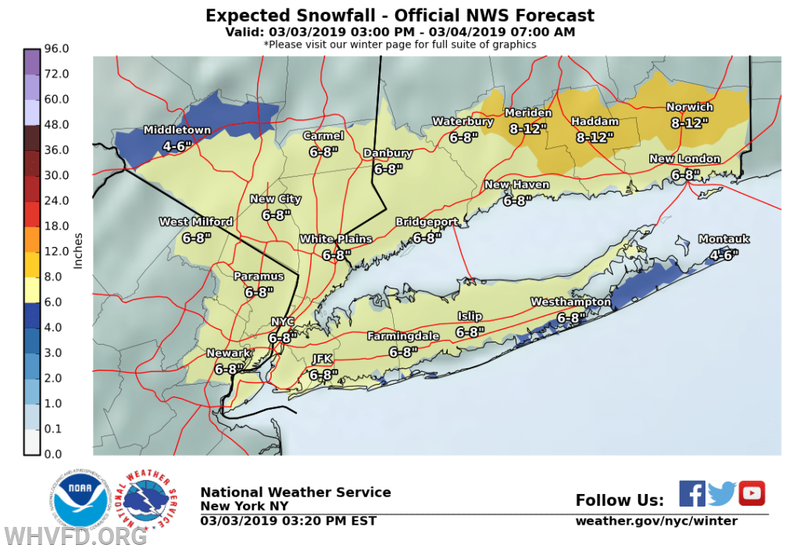 Total snow accumulations of 5 to 8 inches expected. Total ice accumulations of a glaze. the Lower Hudson Valley, and New York City. * WHEN...Until 7 AM EST Monday. * ADDITIONAL DETAILS...Travel could be very difficult. The hazardous conditions will impact those traveling tonight, and the Monday morning commute. Heaviest snow expected mid to late this evening into overnight.